Marilyn SanClemente July 26, 2016 July 26, 2016 All Occasion Card, All Occasion cards, Global Design Team, handmade card, Handmade cards, Stampin' Up! 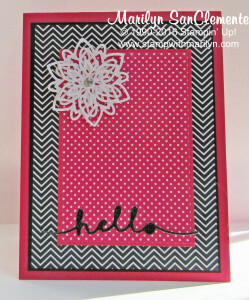 Today I am sharing a handmade All Occasion card that I made using the new Stampin’ Up! Desinger paper Pop of Pink for this week’s Global Design Project challenge. I love the combination of a bright color with black. In this case the Pop of Pink Designer paper combines Melon Mambo, Basic Black and Gold in the papers. So here are the details of this card. The Card Base is a piece of Melon Mambo card stock cut to 4 1/4″ x 11″ scored and folded at 5 1/2″. Next is the black layer with a piece of Basic Black card stock cut to 5 1/8″ x 3 7/8″ with a piece of the Black Herringbone designer paper cut to 5″ x 3 3/4″. Next is a layer of Melon Mambo card stock cut to 2 3/4″ x 4″ and a piece of Melon Mambo designer paper cut to 2 5/8″ x 3 7/8″. 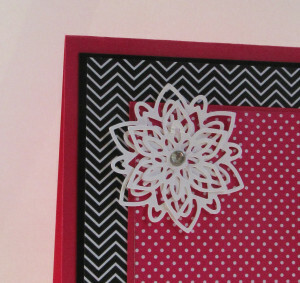 I love the new detailed thinlits that Stampin’ Up! is offering with this new catalog. I used the floral images from the Flourish Thinlits to create a delicate cut out flower. Last I added a message using the Black Glimmer paper from last year’s Holiday catalog which I happen to have laying around. Amazing card Marilyn! Love your interpretation of the sketch this week. Thank you so much for playing along with this week’s Global Design Project challenge! What a gorgeous, vibrant card Marilyn. So much fun! Thanks so much for sharing your talents with us and joining in with this week’s Global Design Project.